Some of you are aware from reading my blog or elsewhere that radon gas exposure is estimated to cause 15,000 – 20,000 deaths in the United States but is even more likely to affect smokers. 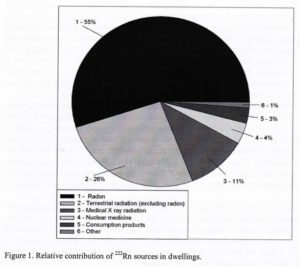 As of this writing it is estimate that radon is responsible for 3-5 % of all fatal lung cancers, but specifically up to 10-15 % for smokers. In the chart below, you can see that radon gas contributes the majority (over 1/2) of the harmful radiation that an average person is exposed to over their lifetime including medical X-Rays. Where does the radon gas come from? Much of it is from soil exposure, but a sizable contribution within indoor dwellings comes from building materials such as brick, concrete, etc. and particularly stone such as mildly radioactive granite and marble which are found in kitchen and bath counter-tops. (ScanTech can test natural stone materials for excess radioactivity) Other potential sources are in the water and natural gas supplies; even in burning coal. 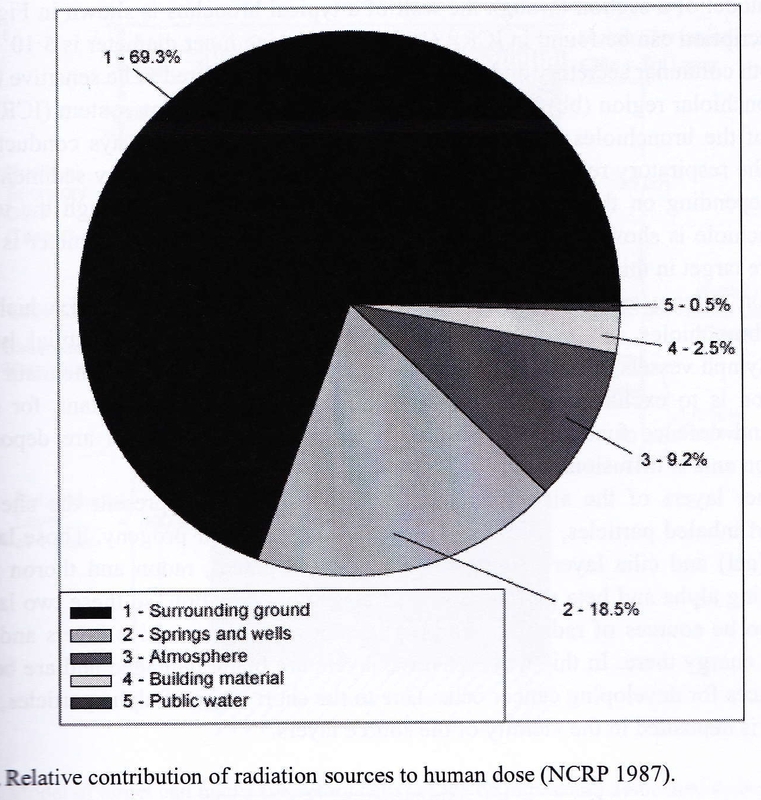 Radon is soluble in water, particularly cold water and can be released while cooking, bathing and cleaning. It can also find it’s way into the breathable atmosphere through commercial activities such as ore processing, burning of coal in power stations and the use of agricultural fertilizers. This entry was posted in EMF Testing Bio-Electromagnetic Health & Safety Levels, Radon Gas & Safety Testing - Dallas / Ft. Worth and tagged health, Radioactivity, radon gas, safety on October 31, 2013 by jagman777. The controversy of Smart Meters is getting so prevalent that I feel a compulsion to share some of my data with respect to certain claims and fears that the public has about this deployed technology. There are a number of website and organizations dedicated to banning this device for various reasons. Some of them deal with potential privacy invasion issues or the theory that the power company can somehow selectively turn off certain appliances without your permission. 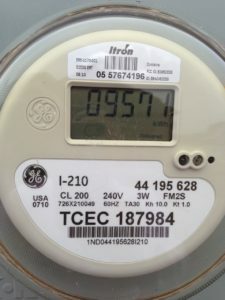 While I cannot comment on the political or civil liberties aspects of the Smart Meter debate, I have now done enough measurements to get an idea of just how much energy these devices are putting out and probable public exposure. The short answer is: not that much. 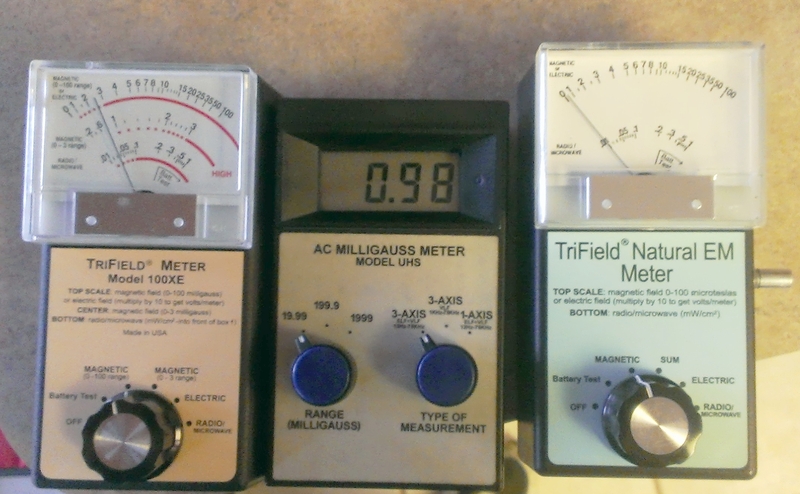 For one, I cannot believe that a Smart Meter puts out less RF than what emanates from a human body (I have no idea where they are getting that notion from – even brainwaves are severely attenuated outside of the body which is why electrodes are needed for EEGs) or the earth itself – at least not at point blank range. And this brings up another hidden factor – at what distance from the source are these measurements taken? 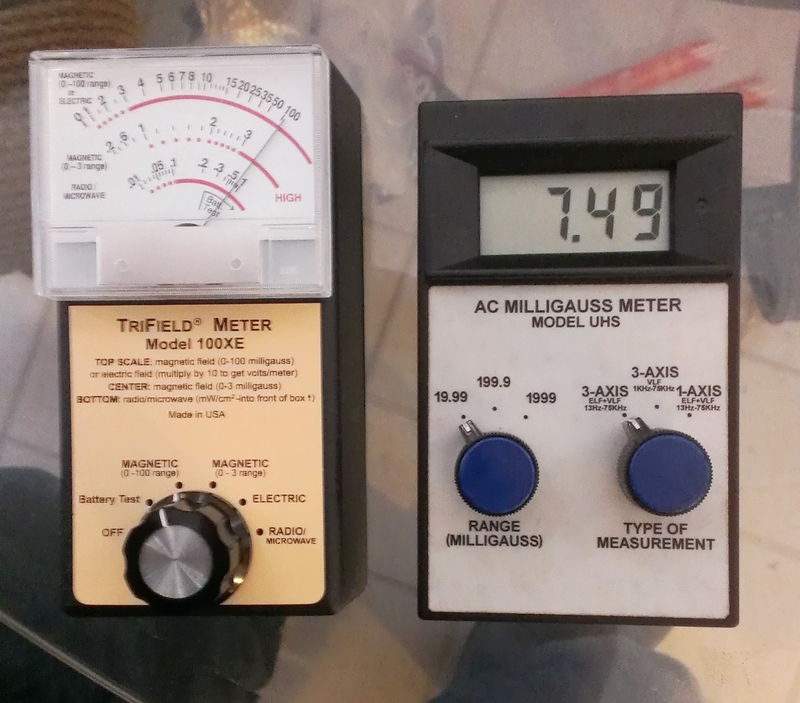 Because radiated power from an ideal isotropic antenna falls of with the square of the distance, if you even move the measurement meter a few feet from an RF source, the power levels drop dramatically. Also, they are using milliWatts per cm^squared instead of the more typical microWatts/cm^2 (or uW/cm^2) which is more routine for measuring low level RF at a moderate distance. I suspect the reason why is because in using the milliWatts convention (in which 1 milliWatt or mW is = 1000 microWatts) you get to put all of those zeros after the decimal place and make the numbers seem even smaller. There are specific reasons why I have chosen to point these specific concerns out besides just being picky – they also inform the reader to pay attention to the context in which this data is presented. I just got done measuring my Smart Meter and at a distance of 3 feet which is as close as anyone would even causally walk past it, I only get a maximum of 1.5 uW/cm^2. That only occurs in a very short burst (less than one second) every minute or so, so the actual exposure averaged over time would be far less. (closer to the nanoWatt range) Please note that such an intermittent burst is NOT the same as the pulsed signals that you read about as being harmful. Those are frequencies are continuously pulsed in at least the MHz or GHz range – what I am talking about is more like a substantial fraction of Hertz or 0.016 Hz if it is one second out of every 60. 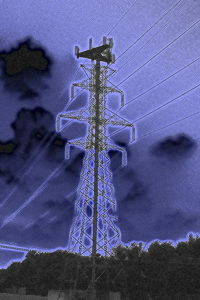 My cell phone when running at full power puts out over 2 uW/cm^2 and it is right next to my head when making a call. While the frequencies involved are somewhat different, the RF dosage is roughly comparable except that the cell phone is consistently much closer to my body for more extended periods of time. 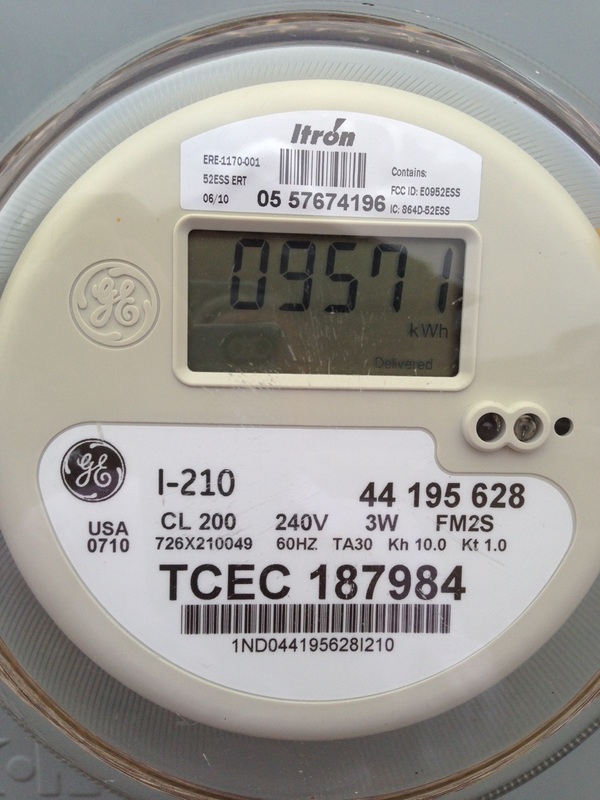 I doubt I spend more than 30 minutes a week being within 10 feet of my Smart Meter. What non-technical critics also fail to realize is that the metal backing of the case on the Smart Meter which is in between the RF and the occupants inside the home is grounded and right next to the point source – therefore shielding much of what is already fairly low level RF. Also what many people seem to forget is that the Smart Meter mounting locations are at the main power feed or drop into the home where the magnetic field tends to be the strongest. 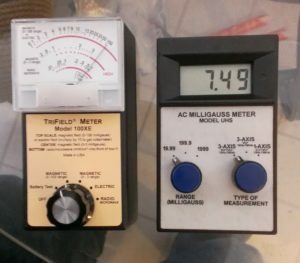 Therefore as a very respected EMF consultant pointed out recently, it is not the RF from the Smart Meter that should be such a concern, but the elevated magnetic fields that you get in the vicinity of any major power feed into the home. But the bottom line is that if someone is convinced that a Smart Meter installation at their home is a threat to their health or the well-being of their family, then there is no sense in arguing the point. My primary role is not to change someone’s mind, but to help them find peace of mind with a set of feasible solutions. Have you ever had something that seemed small, like a cupboard door that doesn’t hang quite right, or an argument with a coworker that just stuck with you all the rest of the day? We are unsettled because of the feelings of things not being symmetrical or completely in our control and regardless of the actual relevance or meaning, it causes stress and stress is definitely a factor in disease, accidents and our enjoyment of life. Please contact me at www.scantech7.com for details if you are interested. BTW, trying to make one yourself such as a solid Faraday cage will probably block the data signal and also get you into trouble with the electrical company. The price of one installed by this particular gentlemen compares very favorably with other units sold on the Internet. Furthermore, it is rugged and designed to be vandal resistant so even if RF protection is not of interest, it may be a good investment for commercial customers looking to reduce the costs of malicious destruction. This entry was posted in EMF Testing Bio-Electromagnetic Health & Safety Levels, RF Testing Cell Phones Smart Meters Weak Tower Reception, Smart Meters - Safety Level Risks to Health and Cancer and tagged home, inspection, inspector, RF, safety, Smart Meters on June 30, 2013 by jagman777.